With the original part of the property being built in 1938, Cameron Highlands Resort is a true colonial experience overlooking the one and only Cameron Highlands Golf Course, 1,500 metres above sea level. Once the hotel comes into view, you are struck by the elegant curved facade of the building, with the signature black and white colours Tudor style exterior which is commonly seen in almost all buildings in this “little corner of England in Asia”. mylifestylenews explores the much of the character of the highlands remains unchanged since the colonial times. Being part of the Small Luxury Hotel group, hence, there is always something to look up to even before the arrival. Cameron Highlands Resort is nicely situated between two key towns -Tanah Rata and Brinchang, being the biggest town and second biggest town in Cameron Highlands respectively where the major activities are held. 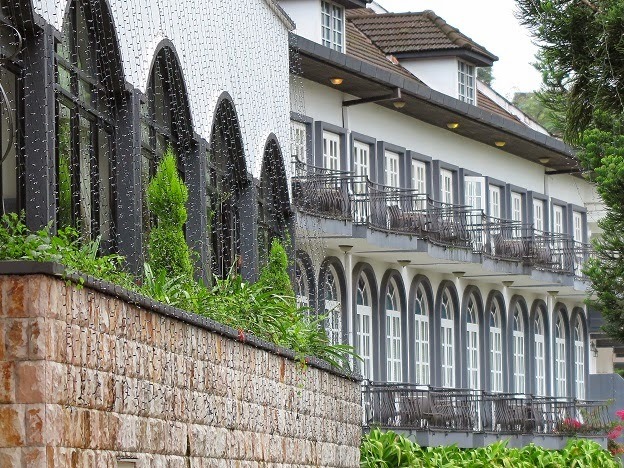 With breathing taking scenery, lush greenery and rolling hills, the hotel is built on a low rise, but a long stretching building with two levels with tall French doors, timber-beamed ceilings and plantation shutters adding the grand colonial heritage charm with a touch of nostalgia. We arrived just past noon and the check-in was a bit lengthy despite being identified by the Front Office Manager after we parked our car in front of the grand entrance while entering the lobby. Staff communication at this point could have been more helpful as they had not informed us the room was not ready. We weren't in any particular hurry, but better communication would have made everything more succinct and polite, as it were. We sat waiting for our key while sipping the welcome warmed tea, it was only at our prompting that they then had to inform us of a delay, even though we were told later that the hotel was not running high occupancy and we wondered why. So we chose to hit the road for a quick reconnoiter of the surrounding locale. On our return an hour later, we picked up the key and duly escorted. Due to the age of the original part of the building, the 56 rooms and suites resort is rather spacious capturing the nostalgic elegance of an age with bespoke teak furniture merges with Jim Thomson’s finest quality silk fabrics. We were allocated a pleasant 38 sqm deluxe bedroom with quite a generous proportion, once again in the colonial style: a four poster bed that adds a touch of old world glamour and truly looked like it was meant to be there. A pleasant lounge area by the windows sets the mood of old colonial living with French doors opening to the balcony. The bathroom is built in a very large shower bay equipped with a rain shower and the hotel groups’ signature Mangosteen toiletries and the usual mod-cons of a safe, tea and coffee facilities, etc. All the rooms are facing the golf course with polished timber floors, beamed ceilings and balconies. Hence, a pleasant vista to be had evokes a Colonial feel while enjoying the cool crisp air on the picturesque plateau and its surrounding hills and forest of Cameron Highlands. The décor is unfussy and remained its colonial charm as you will be drawn to the architecture than to over the top interior design, it is all tastefully done with hanging ceiling fans, open fireplaces at the main lobby level and graceful lounges as well as the library, such room of space that you do not often find in new hotels these days lending itself to a grand age of enjoyment. As the weather front moved in for the afternoon, we thought a spot of the English High-Tea in the Jim Thompson Tea Room was in order to lift our spirits and enjoy the premium local tea from the nearby BOH Tea Plantation. Scone are freshly made daily along with the local strawberry jam also in-house produced from the highlands strawberry farm. Other delectable delights were also included, such as finger sandwiches, éclair, macaroon, tart and etc. The fluffy scones and finger sandwiches are really stand out, classics English ingredients such as cucumber, cream cheese, eggs and watercress are used. The choice of chinaware also made a difference to the enjoyment with a well chosen dainty tea service. The experience of a strong brew of highland tea can be prolonged to suit your contentment whilst the tea menu selection has something for everyone, including a number of fruit infused choices. We opted for the classic BOH Gold Blend and Earl Grey with tangerine infusion to suit our mood without any disappointment. Breakfast is served with a semi buffet order the Dining Room with superb ingredients, execution and presentation. A separate warm cook dishes and eggs on the given are with unlimited serving. We recommend the absolutely must try - The Fried eggs on hash corned beef; poached eggs; strawberry and chocolate waffles; pancakes with apple comport slices and fried mango - each of these was cooked to perfection. Yet, with the amount of quality food selection, skipping lunch is rather a good idea. Our stay was rather pleasant although there were a few niggles here and there, with some miscommunication with staff a number of times. Nevertheless, there are some parts of the property needs an update due to old hardware and the constant humidity. Our mantra is, it is all in the details, some improvement in attention to details will make all the difference to achieving the true standard of a SLH property. As the ambience of the hotel was so relaxing that won't be forgotten on our return to the city life, do not expect bells and whistles, but an opportunity to take things more slowly and hark back to another era of enjoyment.